Print media and online advertisements are created upon the client’s requirements and there may be other mode of advertisement also. Websolutions India gives value to the corporate identity of the company. What we mean by corporate identity is that your website colors, your logo, your letter heads, your business cards all must reflects your uniformity in colors and color combinations. Looking for an exclusive brand identity - we are here to give you a hand. Our creative designers will help you to create a unique brand status that allows you to convey the real motive of your business by attracting the target customers. So here is an oppurtunity to stand out in a competitive market. 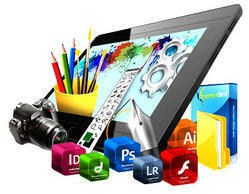 Creative graphic design for both print and screen that compels your target audience and evokes the right response. From business cards to web sites.